Mike Wells started working in the family business in 1977 as a route driver while working his way through college, and joined the Blue Bunny sales force in 1981 upon graduation with a BS in Business Administration. Early in his management career, Mike held various positions culminating with a series of Sr. management positions which eventually led to his title as COO in 2007. On November 13, 2007, Mike assumed his current position as President and CEO of Wells and today he continues to lead the family’s 100-year-old privately held company. 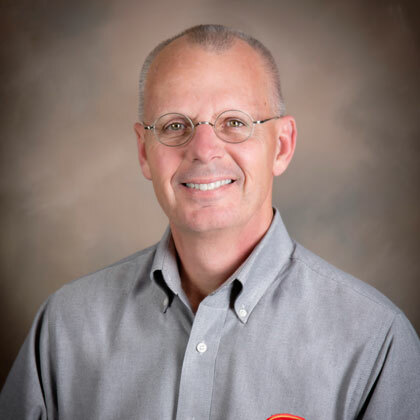 Mike is a recognized leader having received the Ernst and Young Manufacturing Entrepreneur of the Year for the central region, the Edward Deming Entrepreneurial and business excellence award, and the International Dairy foods associations soaring eagle leadership award. Mike is the past President of the Iowa Dairy Foods Association. He is the outgoing chair of the International Ice Cream Association, Board Member of the International Dairy Foods Association, and past Chair of the Iowa Business Council. Mike is also a member of the Retail Owned Food Dealers Association, the Iowa Grocers Association, and the International Association of Ice Cream Distributors and Vendors. Mike’s favorite Blue Bunny treat is a scoop of Premium Vanilla Bean ice cream.